The People's Republic of Bangladesh is a country in South Asia. It has a short border with Burma (Myanmar), but is mostly surrounded by India. It also has a coastline on the Bay of Bengal. Bangladesh is one of the most densely populated countries in the world. As of 2009, Bangladesh had an estimated population of 162,221,000. The capital city, Dhaka, as of 2008, had a population of 7,000,940, with a total of 12,797,394 people living in the combined city and metropolitan area. 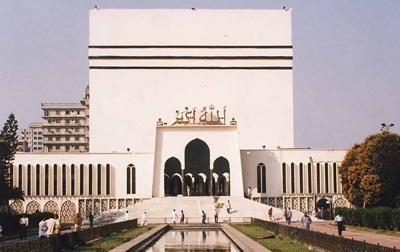 There are four other large cities in Bangladesh (Chittagong, Khulna, Rajshahi, Sythet), the largest of which is Chittagong, which as of 2008, had a population of 2,579,107, with a total of 3,858,093 people living in the combined city and metropolitan area. Atlas Obscura: An Explorer’s Guide to the World’s Hidden Wonders is a virtual celebration of 700 of the most unusual places in the world and will rewrite bucket lists with its descriptions of natural wonders, architectural marvels, mind-boggling events, and bizarre phenomena—all organized by continent and country. Bangladesh is a lush, green country situated on the fertile Ganges delta, adjacent to the Indian state of West Bengal. Although there are hilly areas in the northeast, this densely populated country is mostly flat, and criss-crossed by many rivers. Much of its coastline forms part of the world’s largest mangrove forests, the Sundarbans, home to the Royal Bengal tiger and many other flora and fauna. Bangladesh is young country with an ancient history. The province of Bengal was divided when India became independent in 1947, and its mainly Muslim eastern part became East Pakistan. This was followed by years of upheaval, and in 1971, after a freedom movement and a war, the east Bengali people finally gained independence as the People’s Republic of Bangladesh. Most Bangladeshis live in rural areas, and the majority are Muslims. Historically they have lived in harmony with many other faiths. Bengali, or Bangla, is the lingua franca, and there are several regional dialects. Once the hub of the southern Silk Route, the Bengal delta region has a long and rich cultural tradition. Over the centuries it has been influenced by Hinduism, Jainism, Buddhism, Islam, and Christianity. It is a land of writers, saints, scientists, thinkers, composers, painters, and film-makers. It is famous for its music, dance, and drama; arts and crafts; folklore; languages and literature; philosophy and religion; festivals and celebrations; and its distinctive cuisine and culinary tradition. Bangladesh has been regularly hit by floods and cyclones, but, contrary to what the world usually hears about natural disasters and poverty, there is positive economic growth and the country is one of southeast Asia’s largest exporters of garments to Western markets. Despite the hardships they endure the Bangladeshis are resilient, friendly, and hospitable, and welcome all visitors with a warm smile. This book introduces you to the people beyond the headlines, and offers invaluable advice on what to expect and how to behave in different situations, whether you are a tourist or traveling on business. Authors: Written and researched by Lonely Planet and Daniel McCrohan. An authoritative gateway to the lesser-explored regions of Bangladesh, this guidebook offers greater coverage than any other to the Chittagong Hill Tracts, where 13 different ethnic groups live amid breezy hillside scenery, and to the world’s largest mangrove forest at the Sunderbans (where Bengal tigers occasionally chew on a human or two). With a focus on responsible tourism, it leads trailblazing travelers to those aspects of the country that are almost unknown to visitorsdolphin and whale watching, winter birding in the northern wetlands, and golden Bengal’s silk and archaeological highlights. The book is backed up by a sister websitewww.joybangla.infofeaturing podcasts, photography, travel features and updates. Kids can record their own travel adventures and make a treasured memory book for their trip to Bangladesh, with this travel journal. A great diary and travel companion that will increase children's excitement, this journal offers plenty of writing and drawing space. Helping children become involved in the early planning stages of their trip. This is a great gift for children and a great keepsake for parents. One side is Bangladesh Country and other side is India East. Included inset of Chittagong and Dhaka City.